Home » Not all family meals are perfect; eat together anyway. Imagine what it would be like if we developed reverence for ALL food, not just food that obeys the “healthy” rules. We would treat food with respect and enjoy the ritual of family meals, whether the food is “home cooked,” fast, restaurant, prepackaged, or take-out. We would assign time and attention to feeding ourselves, rather than just grabbing something to keep the hunger pangs away. We would celebrate our eating, rather than making it a duty. To get and keep the meal habit, those meals have to be rewarding – food you enjoy. Our advice: begin by eating what you eat now; just round everyone up to eat it together. 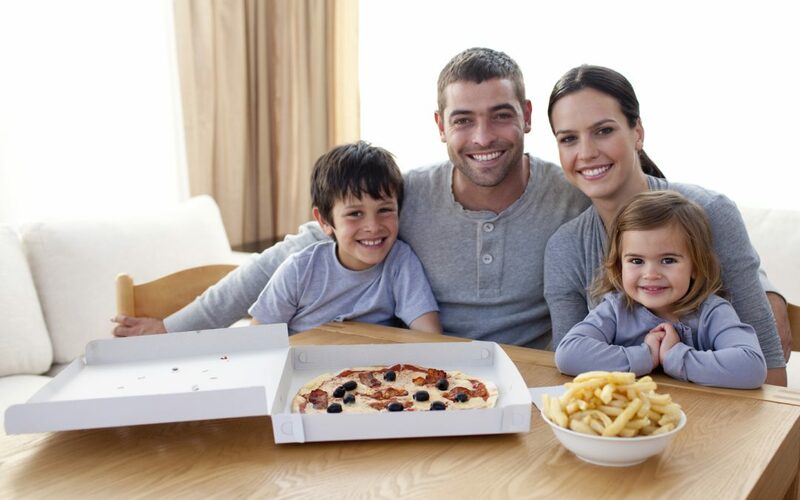 Family meals are when you all sit down together and share the same food, whether your family numbers one or a dozen. A table isn’t even necessary – a blanket on the floor will do. It’s all about attitude. Our eating competence research shows when eating attitudes are positive, people are healthy and do well nutritionally. This couldn’t be more different from the prevailing wisdom. Hi, Ellyn. I’ve just found your book and your website and I’m loving it! I’m a Brazilian mom, I have an Instagram account where I talk about food, BLW, etc. (@comoquecome, something like how to eat) Can I translate your text and post it? With all credits, of course. A voice of sanity in the wilderness. Thanks Alice. Good to hear that you like the Satter approach to feeding. Good to hear that you are enjoying the book and the website. Regarding the translation, please contact [email protected] as we would need to discuss this further with you.